One of the key criticisms of the initial phase of Swachh Bharat Mission’s promotional campaign was the ease with which the country’s large and informal sanitation workforce was made invisible and replaced with bureaucrats, political leaders and celebrities. These well-known figures were often pictured as swishing brooms and urging people to commit to their duty of keeping ‘Bharat Mata’ clean. While these campaigns seemed attractive in their appeal to the masses, they failed to capture the larger complex reality of the country where historical asymmetries, injustices and varied forms of caste discrimination that continue to exist. The dignity and sanitation needs of the common sanitation worker were overlooked, and further sanitized, to present a glorified picture of those who are responsible for keeping our cities and toilets clean. When the focus of the campaign shifted to women and their right to access the toilets with safety and dignity, the emphasis again was laid on the relationship between women, purity and honour, while the rights of the women who are part of the sanitation workforce remained neglected. The focus of the campaign is representative of a larger trend in the societal practices of sanitation and water access that have been practiced in India, and points to the historical ostracizing of people along the lines of caste and class identity when it comes to matters of sanitation. The 2015 paper titled 'Silencing caste, sanitizing oppression: Understanding Swachh Bharat Abhiyan' published in the Economic and Political Weekly, argues that this has to do with the tendency to ignore the link between caste and sanitation. The policy-making bodies are often guilty of turning a blind eye to the age old caste hierarchies in Indian society that expect one section of the society to undertake tasks of cleaning the filth of others. The link between sanitation and purity is widely accepted, and consequently these sections have to bear the stigma of belonging to the ‘polluted castes’ and being permanently unclean. It is further argued that more importantly, the availability of cheap labour to perform these dehumanizing tasks could be one of the reasons behind the nationwide neglect of hygiene facilities and the failure to evolve a modern garbage and sewage management system. Even today, for most of the middle class population, it will be a shocking idea to share household toilets with their domestic help. For many of us, in fact, it is common to devise a separate backdoor entry for the passage of the house help. The more pressing concern, however, is the accessibility of toilets for the people who clean these houses. Many of them travel from far-off localities or slums, and work long shifts. Most of these domestic workers are women, who need to manage menstruation every five days a month. Forget about menstrual leaves, these women are often denied access to washrooms within the households they serve. Working in an upscale residential area, it is often impossible for them to find public washrooms to use, and as a result, they compromise their health on a daily basis. Perhaps, the most alarming detail to this situation is that these domestic workers are typically managed by the women of the household, who should ideally be sensitive to the sanitation predicaments faced by the female worker. However, more often than not, it is the women of the household who impose these discriminatory rules on the domestic workers, while the men pretend to be oblivious. Similar problems are faced by women from low-income groups who work in beauty parlours, garment industry, or as maintenance staff in malls and hotels. Speak to almost any woman who has experience of working for different service-based organizations, and you will get to hear enough stories about discriminatory practices and inadequate, or poorly maintained, and sometimes non-existent toilet facilities. Some of these places reserve their toilets for customers, while the workers who serve them for almost 10-hour long shifts are compelled to use public washrooms. Many women who service the glowing and exceptionally clean toilets in popular malls are asked to use a separate rundown toilets meant for the staff. Some of them are expected to ask for permission or sign registers before taking a break to relieve themselves during the long hours of their shifts. Not only is this decree humiliating for the workers, it also significantly violates their right to dignity and access to bathrooms. Access to water and sanitation and the quality of these services in our country is inextricably linked with identities of caste, class and gender. In urban scenarios, the situation is made complex by the consideration of class, as more and more girls from low-income families are taking up jobs in the sanitation workforce in big cities. In large corporate houses and glitzy malls that have dotted the urban landscape with their promise of clean and functional toilets for the working woman, it is ironic to note that the class struggle continues to exist when the women in the maintenance staff are compelled to use toilets separate from the ones they service. The discrimination is often justified by citing the necessity of maintaining hygiene, which however sounds paradoxical when the same workforce that has been delegated to clean the toilets are also suspected of compromising its hygiene if they personally use it. Moreover, the practice harks back to age old systems of caste discrimination in matters of sanitation and manual labour. 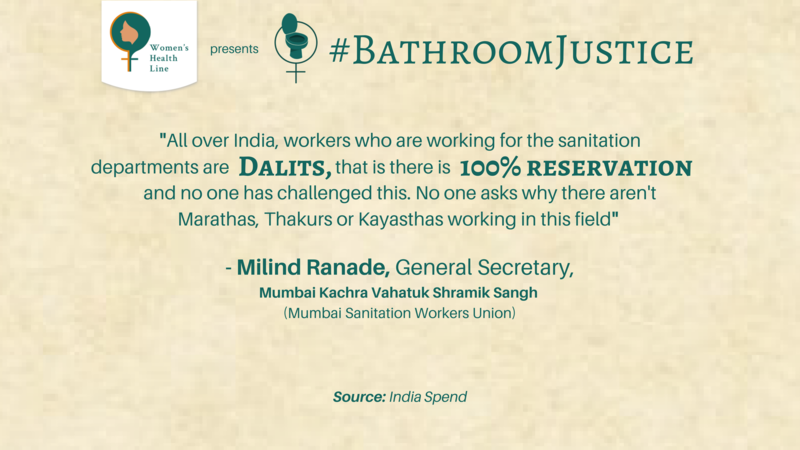 The fact that nobody seems to bat an eyelid over the normalization of this discriminatory treatment meted out to the sanitation staff leads to the only explanation possible, that is, caste and class discriminations have become so commonplace and embedded in our psyche that we no longer find anything wrong with it. Among the female workers who go through this discrimination, not many are aware of the political implications of this practice and of being deprived of their rights. Most of them are accepting of this treatment as part of their occupation. The ease of being fired from their jobs have deterred many, who have a certain understanding of the nature of this injustice, from speaking out. However, for most of them, the payment of adequate wages in time, sanction of leaves, and looking out for their families continue to be the more pressing concerns, as they attune their bladders to their daily struggle for access to bathrooms. A freelance writer and editor, Ira has written on invisible disabilities and sexual health and reproductive rights. She is interested in researching on memory and material culture, and is currently working as an editorial consultant for the 1947 Partition Archive.